The Foraker IN Light Hooded Jacket Men is a lightweight insulation jacket for alpine pursuits requiring optimum freedom of movement, wind protection and a stable core body temperature. 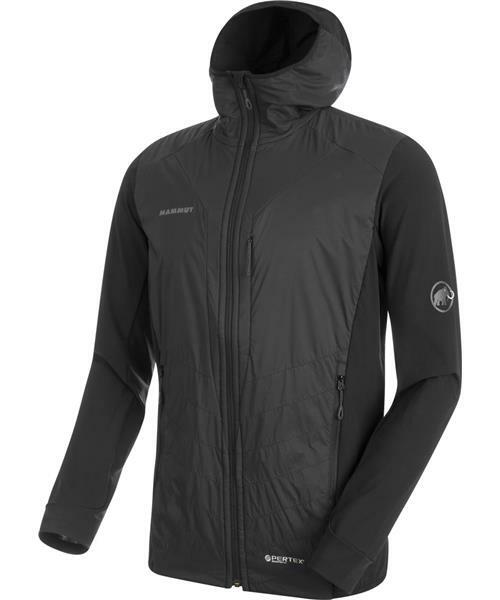 The hybrid jacket is a carefully designed combination of extremely light, wind-repellent and water-repellent Pertex® Microlight outer material, air-permeable stretch material on the sleeves and highly breathable Polartec® Alpha® insulation. The Polartec® Alpha® material on the body provides protection from overheating during activities and yet still offers sufficient warmth during rest phases, making it an optimum insulation material for intensive pursuits. The jacket can be stowed in a chest pocket and then transported easily on your climbing harness, thereby optimizing your weight and load when climbing.